This layout is a customised version of the flexible square style. The header was made in photoshop cs using resources which can be found here and images of Fernando Alonso taken at the 2010 Bahrain GP. Some of the icons are from famfamfam, and the rest are made by me. The Fernando Alonso mood theme is also made by me. The content of this journal is slash friendly, however there is a filter so if you don't like it you don't have to read entries about it ;) Feel free to tell me whether you want to be on the filter or not. The contents of this journal are of a very pro Fernando Alonso nature, however there is a filter for picspams of him. If you wish to be added but do not wish to see any pictures of him then just tell me and I'll happily add you to the filter. Hi, since we're both interested in Phil Jagielka and Westlife, is it okay if I add you? Phil Jagielka? wow, are we thinking of the same guy? the one who plays for Sheffield United? Hey, I've added you - hope you don't mind! Fernando fans are scarce on the ground!! do you know what? I just asked if i could add you on the community! Hey! I hear you have Fernando pictures, mind if i friend you? Hi Marie! Can we be friends? I'd really be glad! *waves* hi. awwww that's really sweet! *laughs* that's one of the best reasons i've seen. I'm a new F1 person & the first person I noticed was Mr Alonso. He's so freakin' awesome xD. And I support him =D. Do you mind my adding you ? I come here a lot because I love your icons !! 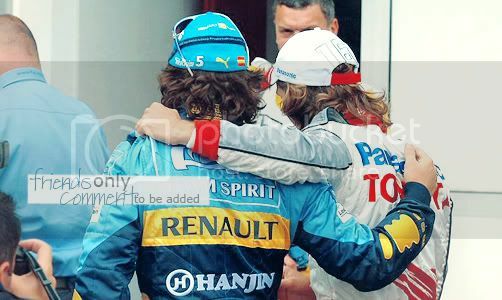 lol I love Alonso but Raikkonen is my favourit. Hope you're ok ! I'd like to be added please. I love Fernando. I don't mind being on the filter either.